This piece of paper is 21 cm x 26.8 cm. It's a lovely blue in color with some fading along the lines where it was folded. It has a watermark: I can read SANDRINGHAM clearly. The next word is DUA, then some character I can't figure out, then IS. From the other side the character looks like a J, but then the rest of the letters are backward. Then comes a stylized PP with the two P's linked, and finallly PARIS. 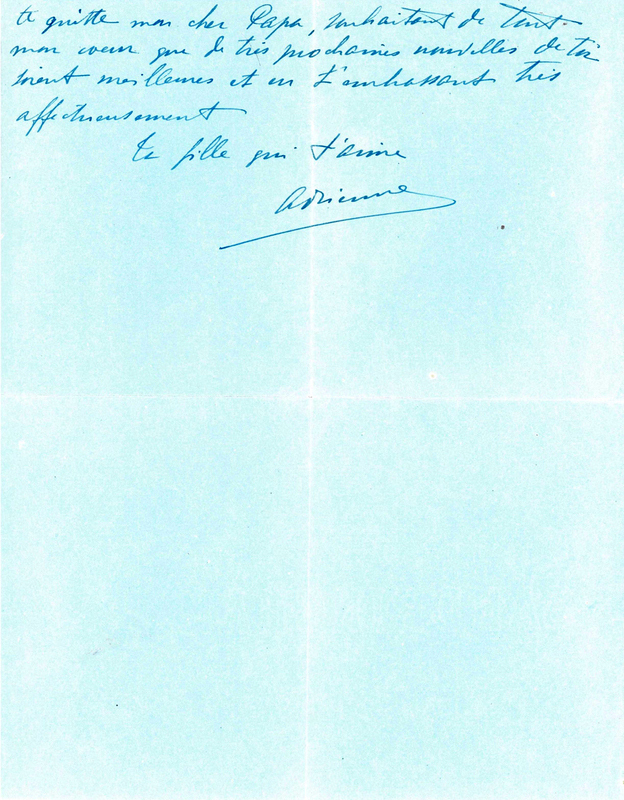 The letter is handwritten in French on the front and back and is signed "Adrienne." 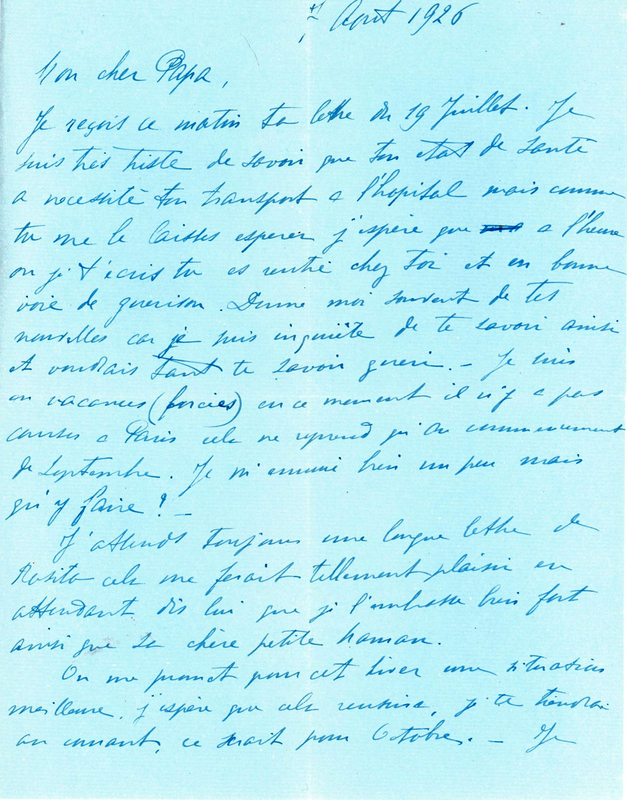 The salutation on the first page is Mon cher Papa: "My dear Papa." So here finally is proof that my conjecture about Adrienne was correct and that she was Jean's daughter. 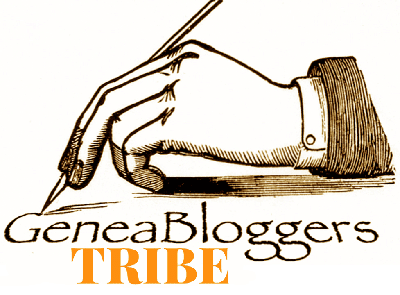 No, this is not a letter from Rosita! Unfortunately, Adrienne's handwriting is not nearly as clear and legible as her father's, so my translation tonight will probably be less than perfect. The envelope in which the above letter arrived to me is 14.2 cm x 10.2 cm. It's also blue, but a little darker than the letter. 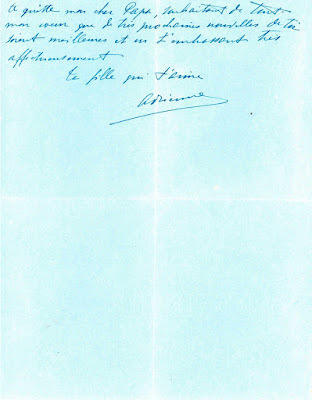 It is addressed to Monsieur Jean L. La Forêt (Adrienne even included the circonflexe over the "e" in Forêt). 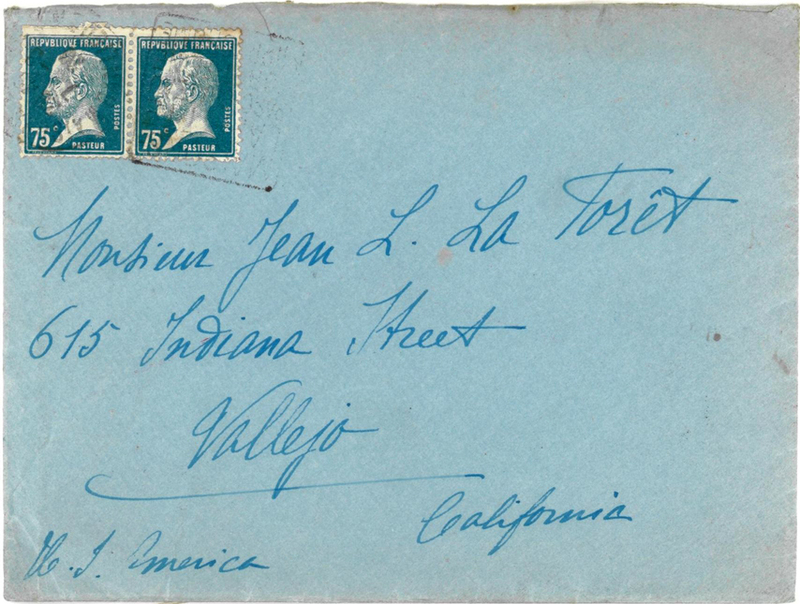 The address, 615 Indiana Street, Vallejo, California, is the same one Jean included at the top of his letters to the French Consul General that he wrote four months before this letter from Adrienne. 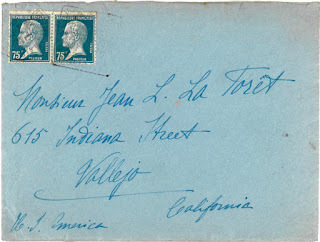 I cannot read the postmark over the stamps, so I don't know when it was sent or from where. Adrienne's writing is clear enough on the envelope that it doesn't require transcription. 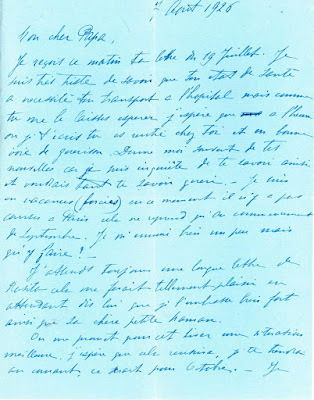 I have transcribed and translated the letter below. J'attend toujours une longue lettre de Rosita cela me ferait tellement plaisir en attendant dis lui que je l'embrasser très fort ainsi que le chère petite haman(?). On me present pour cet hiver une interstice meilleure, j'éspère que cela reussira, je te tiendra au courant, ce serait pour Octobre. – Je te quitte mon cher Papa, souhaitant de tout mon coeur que le très prochaines nouvelles de toi soient meilleures et en t'embrassant très affectueusement. I received this morning your letter of July 19. I am very sad to learn that your health condition required you to go to the hospital, but ??? you left me hope and I do hope that as I write this you have returned home and are on the road to recovery. Send me updates often[,] because I am anxious to know and want so much to know that you are better. I am on vacation (involuntary) at this time[,] there is nothing happening in Paris to bring me back until the beginning of September. I am very bored[,] but what to do? I'm still waiting for a long letter from Rosita[,] which would make me so happy[.] While I am waiting tell her that I send her a big kiss, the dear little [haman?]. I should have a better break this winter, I hope it will be successful[.] I will keep you informed, it would be for October. I leave you my dear Papa, wishing with all my heart that the next news about you is better and sending you fond kisses. The big news from this letter is that a couple of months before he died, Jean was in the hospital with some unknown ailment. We'll have to wait to find out if he did get better and make it out of the hospital at some point. For some reason, I'm happy to hear that Adrienne and Rosita were in touch with each other. Over these months that I've been questioning whether Adrienne was actually Jean's daughter, I also wondered how much communication there was between her and Jean's "second" family. It sounds as though Adrienne was living in Paris, but because I can't read the postmark, I don't know where she was spending her forced vacation. If she had a forced vacation, maybe she was working? Or maybe this was just the normal "everyone leaves Paris in August" type of vacation. In 1926 Adrienne was 42 years old. She didn't write her name on the envelope, so we don't know if she was married or was still a La Forêt. We really don't know much about her at all.